Often times our clients who do Information & Referral (I&R) need to export some or all of their resource or referral database to share with a third party. And while all Admins have access to the Data Export tool that gives them an Excel-readable export of all records and all fields, a more refined approach is needed for specific requests. For example, you might need to create a nicely formatted Microsoft Word document of just the Child Day Care providers in a particular city and just with a handful of informational fields. Or you might need to create an Excel listing of Food Pantries that serve Veterans in a three-county area. As well, you need to produce both of these files once per month and distribute them to your partners. You can imagine that laboriously exporting all of your resource data and then laboriously removing fields and rows, then formatting it just the way you want to, could be very time consuming – especially if you have to do it on an ongoing basis. That’s where iCarol’s Specialized Resource Exports to Word and Excel comes to the rescue. With it, you can create an unlimited number of “templates” with a targeted set of conditions and formatting to export just the resource data you want to Word or Excel, and have it formatted in the font type and size of your choice. You start by naming a new template, choosing either Word or Excel, and indicating what record types (Agency, Program, Site) you want to be included. Next you specify which standard and custom fields you want included. Then you add any filters you would like to limit the exported records. Geographic filters indicate that records physically located within, or that are designated to serve, one or more areas are the records to be included. These areas can be as small as single postal codes, towns, cities, counties, regions, states/provinces or entire countries. You can even mix and match a number of different types of geographic areas. 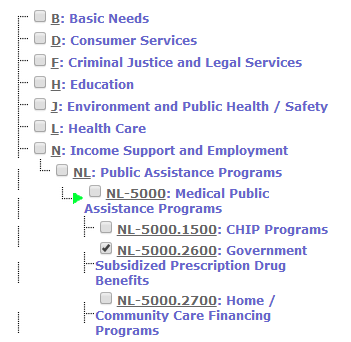 Depending on what sort of categorization scheme you use – the AIRS Taxonomy or your own custom categorization – you can also add filters to include only those resources that area assigned to one or more of those categories. In addition to the many standard fields available for resources in iCarol, many of our clients add their own custom fields. For any that are either drop-down lists or check-boxes, they too can be added as filters to confine the resources included in the export down to just those assigned to one or more of these custom fields. After you’ve saved one of these templates, at any time you can tell iCarol to perform an export based on its definition and within a few minutes you’ll have the file ready for your download, use and distribution. As well, we’ve structured the Word documents to make it easy for you to add your own title pages, tables of content, indexes, headers, footers and more. That makes it easy to include the content in a larger document and brand it with your agency’s identifying information. If you’d like to add Specialized Resource Exports to your iCarol system and provide your community with targeted resource directories, contact our for more information.